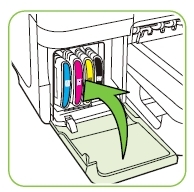 This icon shows the amount of ink in the ink cartridge. 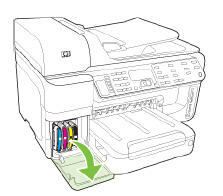 The color of the icon corresponds to the color of the ink cartridge, and the fill level of the icon corresponds to the fill level of the ink cartridge. Ink level warnings and indicators provide estimates for planning purposes only. When you receive a low-ink warning message, consider having a replacement cartridge available to avoid possible printing delays. You do not need to replace cartridges until prompted to do so. 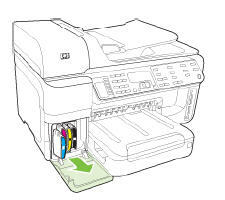 Which ink cartridges do I need for my HP Officejet Pro 8500 Printer? For your US HP Officejet Pro 8500 (A909) All-in-One Series you need HP 940 Black (XL) and HP 940 Cyan/Magenta/Yellow cartridges. There are also Combo Packs (4 cartridges in one pack) available, like the HP 940XL Black Ink Cartridge and HP 940 Colors Standard Yield Cartridges Four Color Combo Pack. For your European and UK HP Officejet Pro 8500 (A909) All-in-One Series you need HP 940 Black and HP 940XL Cyan/Magenta/Yellow cartridges. There are also Combo Packs (4 cartridges in one pack) available, like the HP 940XL 4-pack High Yield Black/Cyan/Magenta/Yellow Original Ink Cartridges (C2N93AE). 2. Pull out main input tray, load paper and slide in the input tray. 4. 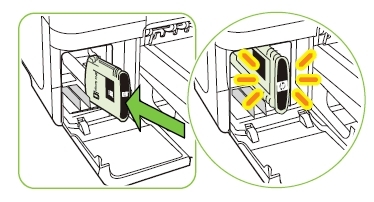 Remove the ink cartridge that requires replacement by grasping it and pulling it firmly toward you. 5. Remove the new ink cartridge from its package. Do NOT touch the electrical contacts and ink port. 6. Align the cartridge with its color-coded slot and insert the cartridge into the slot. Press down firmly on the cartridge to ensure proper contact.